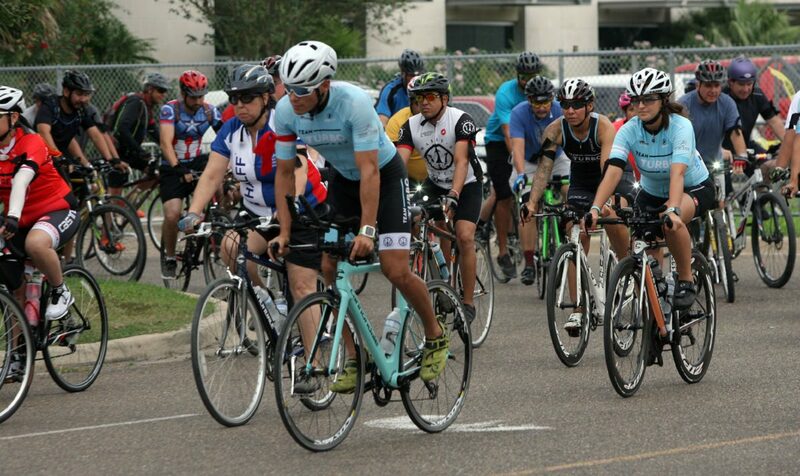 Over 100 bicycle riders took to the streets for the Ride Of Silence Wednesday May 17, 2017 in McAllen. The death of McAllen cyclist Melissa Robles, who was struck by a motorist on Feb. 19 in south McAllen, just weeks before her 33rd birthday, undoubtedly will be on the minds of many tonight as our communities collectively gather and participate in various Ride of Silence events throughout the Rio Grande Valley to commemorate cyclists killed or hurt on area roads. In McAllen, Robles’ brother is scheduled to tell participants how this tragedy has affected his family. He will speak prior to tonight’s 7 p.m. Ride of Silence event, which for the fifth year will again begin at The Monitor’s parking lot, located at 1400 E. Nolana Ave. Many of Robles’ training partners from the 5 AM Wake-Up Ride bicyclist group are expected to participate in the nine-mile ride. Just as many of them did in 2014, the year that Eddie Arguelles, of Edinburg — who was also part of the training group — was fatally struck and killed during a pre-dawn ride. The deaths of Robles and Arguelles have hurt our cycling communities, but we are heartened that tonight at least five different Ride of Silence events will be held throughout the RGV in: McAllen, Weslaco, the City of Hidalgo, Harlingen and Brownsville. 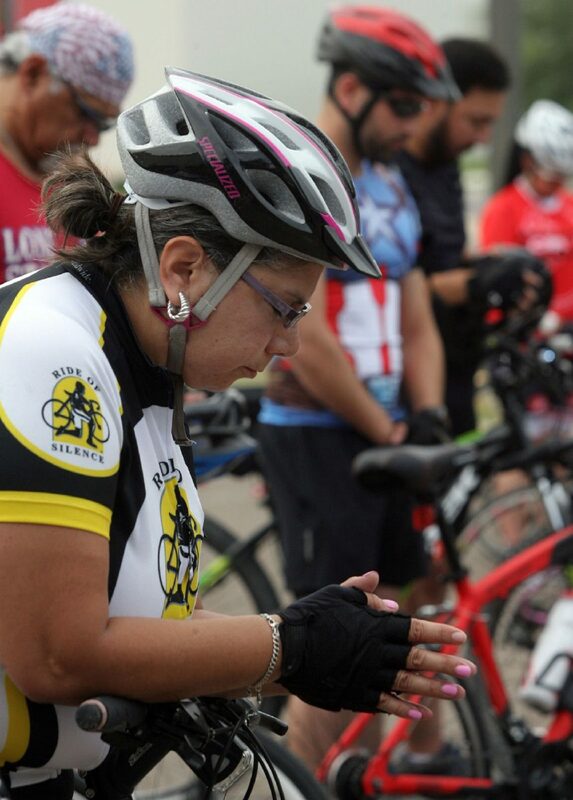 Hundreds of cyclists are expected to participate in the various rides, which all start at 7 p.m.
Sandie Acosta of McAllen bows her head in prayer before the Ride Of Silence Wednesday May 17, 2017 in McAllen. We view the addition of so many Ride of Silence events as proof that Valley residents want safer roads for all, and more awareness and respect from motorists for those not on four wheels. We recognize this support also has come in the past few years from area municipalities, including several that participated in a 100-mile long street cleanup on Tuesday in preparation for tonight’s special rides. Operation Clean Sweep involved trucks from Hidalgo County, McAllen, Pharr, Alamo, San Juan, Mission, Edinburg, Alton, and La Villa, which recently purchased its first $150,000 street sweeper. In McAllen, the trucks cleaned Nolana Avenue and South Second Street where riders will travel tonight as they pass three white ghost bikes each marking the spot where Robles and two other cyclists were killed over the years. Every RGV Ride of Silence route has a different distance. But all are to be silent and respectful. And every cyclist must wear a helmet and have lights on their bike in order to participate. Even if you can’t ride, please come out and support the riders, or place flowers at a ghost bike. And the next time you are behind the wheel and see someone on two wheels, please be mindful of their safety.